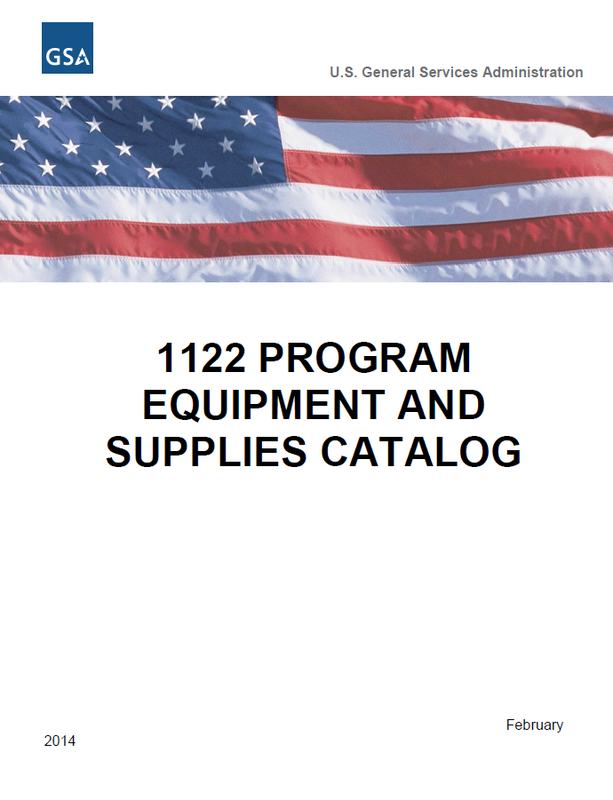 The following is the General Services Administration’s catalog for equipment and supplies that can be ordered through the 1122 Program. Though much recent media coverage has focused on the 1033 Program and the Defense Logistics Agency’s Law Enforcement Support Office, section 1122 of the National Defense Authorization Act for fiscal year 1994 allowing state and local governments to purchase new law enforcement equipment for counter-drug activities through the federal government. Section 885 of the Duncan Hunter National Defense Authorization Act for Fiscal Year 2009 amended 10 U.S.C. 381, to expand the procurement authority under the 1122 Program beyond counter-drug activities, to include equipment for homeland security and emergency response activities. Section 1122 of the fiscal year 1994 National Defense Authorization Act established the authority for State and local governments to purchase law enforcement equipment through Federal procurement channels, provided that the equipment is used in the performance of counter-drug activities. The “1122 Program” affords State and local governments the opportunity to maximize their use of taxpayer dollars, by taking advantage of the purchasing power of the Federal Government to receive discounts commensurate with large volume purchases. The term ‘State’ includes the District of Columbia, the Commonwealth of Puerto Rico, the Commonwealth of the Northern Mariana Islands, and any territory or possession of the United States. The term ‘unit of local government’ means any city, county, township, town, borough, parish, village, or other general purpose political subdivision of a State; an Indian tribe which performs law enforcement functions as determined by the Secretary of the Interior; or any agency of the District of Columbia government or the United States Government performing law enforcement functions in and for the District of Columbia or the Trust Territory of the Pacific Islands. The authority for the 1122 Program resides with the Department of Defense. The U.S. Army, as the Executive Agent of the program, formed a steering committee initially consisting of representatives from the Army, the General Services Administration (GSA), the Defense Logistics Agency (DLA), and the Department of Justice. Today, the Army, GSA, and DLA are actively involved in the program. The Army also maintains a website (http://www.army.mil/article/18384/) that contains a variety of information regarding the 1122 Program. One of GSA’s responsibilities under the program is the development of a Catalog that delineates the items available under the 1122 Program. Section 885 of the Duncan Hunter National Defense Authorization Act for Fiscal Year 2009 amended 10 U.S.C. 381, to expand the procurement authority under the 1122 Program beyond counter-drug activities, to include equipment for homeland security and emergency response activities. The term ”State” includes the District of Columbia, the Commonwealth of Puerto Rico, the Commonwealth of the Northern Mariana Islands, and any territory or possession of the United States. The term ”unit of local government” means any city, county, township, town, borough, parish, village, or other general purpose political subdivision of a State; an Indian tribe which performs law enforcement or emergency response functions as determined by the Secretary of the Interior; or any agency of the District of Columbia government or the United States Government performing law enforcement or emergency response functions in and for the District of Columbia or the Trust Territory of the Pacific Islands. The Governor of each State participating in the 1122 Program appoints a State Point of Contact (SPOC) to administer the State’s activities under the program. The ordering process begins when the State or local government activity identifies items needed in support of its counter-drug mission, homeland security and emergency response activities. The activity will use the 1122 Program Equipment and Supplies Catalog to determine if the desired items are available via the Federal procurement system. The SPOC will ensure that funds are available for the purchase request. Any entity wishing to make a purchase through the 1122 Program must contact their designated SPOC in order to make a purchase. This program is still limited to the purchase of equipment only. There are three Life Cycle Management Commands within the Army Materiel Command (AMC) to support and manage specific types of items. For information regarding the availability of specific items, please contact the applicable Army Customer Center. The Tank-Automotive and Armaments Command is headquartered in Warren, Michigan, on the grounds of the Detroit Arsenal. Over 10,000 strong, TACOM’s worldwide mission is to research, develop, field, and support mobility and armament systems. To accomplish its diverse mission, TACOM is functionally organized to support a piece of equipment from inception, through design and procurement, to sustainment until the end of the equipment’s life cycle. Weapons and Ammunition (B-14) Pistols. Rifles. Ammunition.